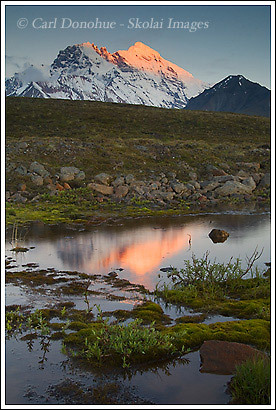 Mount Drum photos, Wrangell St. Elias National Park, Alaska. So here’s Mount Drum at 4:40am. A far better sight than I am at that time in the morning, trust me! I got up and headed out early, but not early enough to catch the color in the sky around 4:15 – the clouds glowed a fiery pink, and I was still putting layer after layer of clothes on. It was pretty chilly this morning. I shot this photo of Mount Drum maybe 50 yards from out little kitchen – the unusually heavy rainfall left a number of small ponds and pondlets scattered across the high tundra, giving me something as a foreground for this photo. I took a few quick compositions, then headed across the tundra for something else as a foreground, and it was amazing how much the light changed in a few short minutes. Mount Drum is typically shot from the north face, or the southwest face – we were a little east of it here, and the high peak caught the morning rays nicely. This entry was posted in Adventures, Alaska, Backpacking and Hiking, Landscapes, People, Travel, Wrangell - St. Elias National Park on August 17, 2008 by Carl D.
Thanks for the post, I appreciate it.I’m glad you enjoy the site – stick around! That’s gorgeous, Carl. Really nice!! Thank you – I was lucky, the light was gorgeous for a few minutes there. That’s the infamous alpenglow that AK is famous for. Great capture of the early light Carl! I wonder how you manage to get out at 4.45am on a chilly morning like that. I like the cold weather to an extent, but good lord, I wonder how much of it I can handle up where you are at the mercy of the wind and rain gods :)..